The Palestinian prime minister has appealed for unity at the start of a rare trip to Gaza, as part of efforts to end a rift between Fatah and Hamas. Rami Hamdallah is heading a delegation from the West Bank-based Palestinian Authority, which is taking over from an administration disbanded by Hamas. He said his priority was to alleviate the suffering of Gaza's residents. Previous attempts at reconciliation have failed, and there are difficult obstacles which still stand in the way. Palestinians in Gaza and the West Bank have been ruled separately since the rift erupted in violence in 2007. Hamas won parliamentary elections in the occupied territories the previous year, and reinforced its power in Gaza after ousting Fatah from the enclave. Hundreds of people packed streets waving flags and cheering as Mr Hamdallah's convoy arrived in Gaza on Monday, his first such visit in two years. "We return to Gaza in order to conclude reconciliation and national unity and end the painful impacts of divisions and to rebuild Gaza brick by brick," he said. Mr Hamdallah said his government would begin taking control of Gaza's administrative affairs, as well as "security responsibilities and responsibility for crossings and borders". He also pledged to prioritise aid programmes for Gaza's two million inhabitants, who UN Secretary General António Guterres said at the end of August were enduring "one of the most dramatic humanitarian crises" that he had yet witnessed. Where are the Palestinian territories? Mr Hamdallah later met Hamas political leader Ismail Haniya and its Gaza chief Yahya Sinwar. Last month, they agreed to dissolve the Hamas administrative committee that ran Gaza and to hold general elections for the first time since 2006. The move was facilitated by neighbouring Egypt, whose relations with Hamas have improved in recent months. Cairo has long seen Hamas as a security threat and has taken tough measures against it, but there have been signs of growing co-operation between the two sides. An Egyptian delegation, and the UN's Special Co-ordinator for the Middle East Peace Process, Nickolay Mladenov, have also gone to Gaza to oversee the transition. Egypt and Israel, Hamas' chief adversary, have maintained a blockade around Gaza since 2006. Hamas calls for Israel's destruction and has fought three wars with the Jewish state. 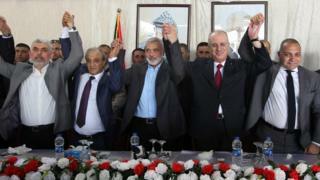 Despite the rapprochement between Hamas and Fatah, a number of issues are yet to be resolved. It is unclear to what extent Hamas will allow the PA's forces to take over security roles, and what will happen to thousands of Hamas civil servants who have not been on the PA's payroll for the past decade. Israel also resolutely opposes any involvement by Hamas in the PA. Along with several countries and organisations, Israel considers Hamas a terrorist group and has said it will not deal with a Palestinian government that contains Hamas members. Mr Mladenov said he was "cautiously optimistic" about the reconciliation attempt. "If the region stays engaged, if Egypt's role continues, and if the political parties themselves continue to show the willingness they are currently showing to work with us on this process, then it can succeed," he told AFP news agency. How much of a shift is the new Hamas policy document?